WARNING: Grinders are Dangerous. 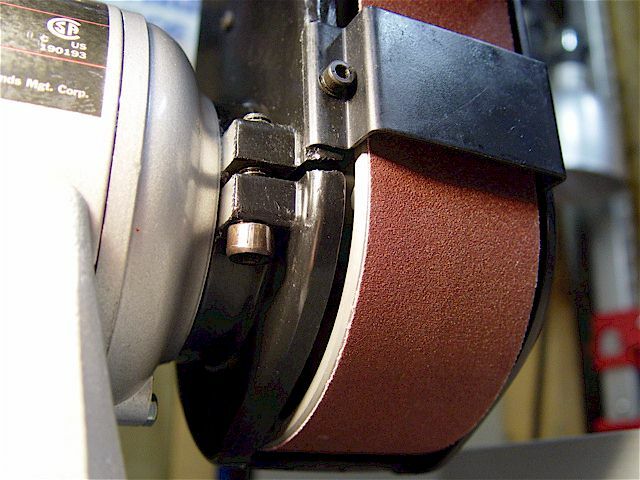 Grinding wheels can break apart while turning at high speeds. follow all of the manufacturer's instructions. Dust from grinding tool bits is dangerous if inhaled. Always wear ANSI (Z87.1) approved safety eye protection, breathing protection, & gloves during machine & tool use. Refer to the Material Safety Data Sheet, or MSDS, for info regarding the properties of a particular substance. 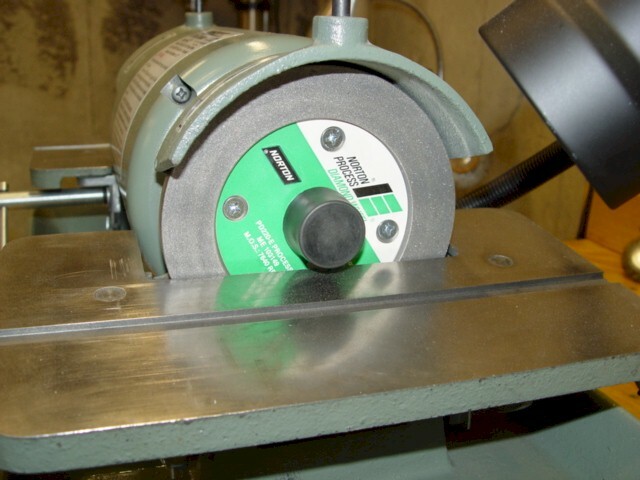 See Tool Post Grinder Section. 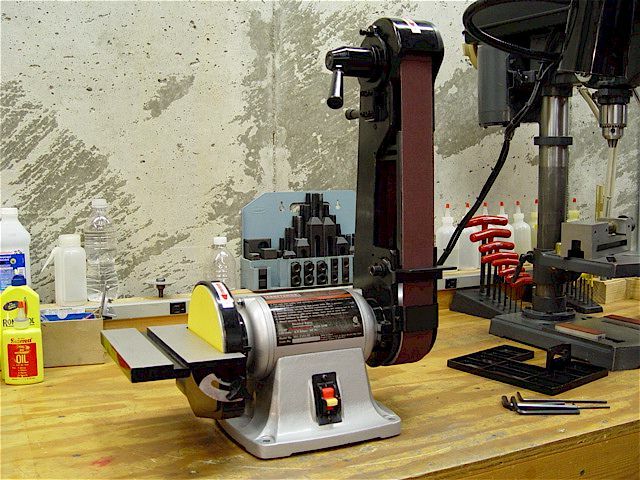 Stock bench grinders can be modified to make them more useful for tool bit grinding & general shop use. tight fit to both the wheel & the grinder shaft. The wheel is now held very precisely on the grinder. Use a star dresser followed by a carborundum dressing stick to make the surface smooth. 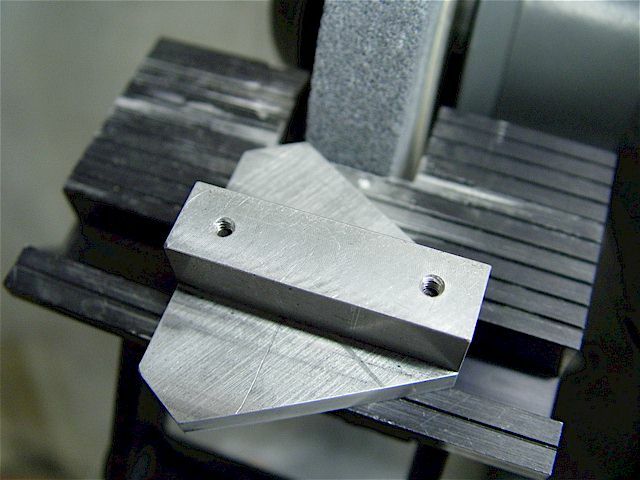 Aluminum shaft spacer for grinding wheel (1.000" OD, 0.500" ID, about 0.75" long). 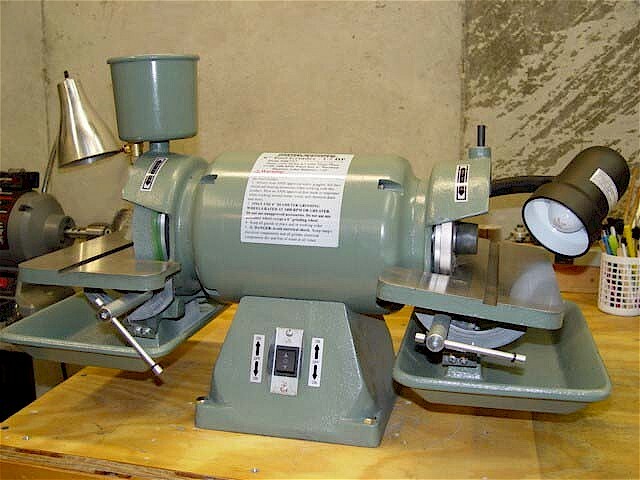 Note: left-hand nut & thread on the left side of the grinder. 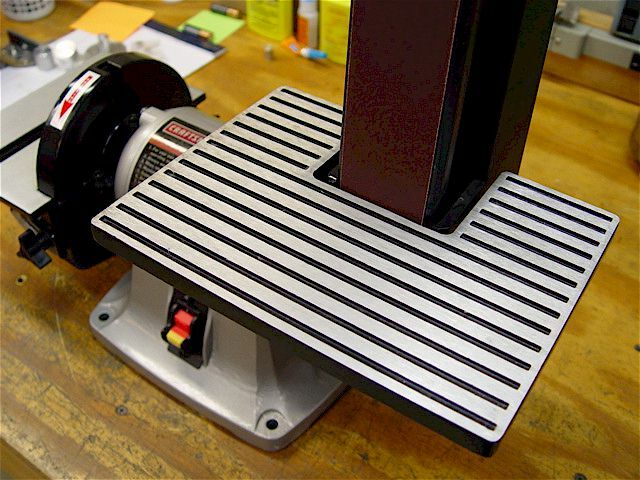 The next mod was the tool rest. Most grinders have inadequate rests & mine was no different. 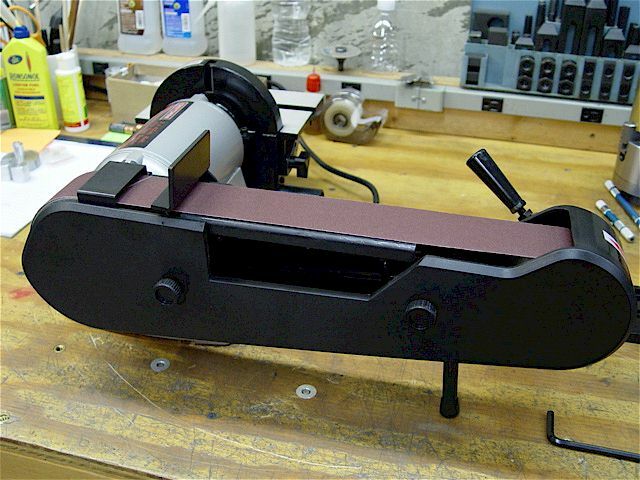 Replaced it with the Veritas tool rest (tool rest manual). It is a great improvement over the OEM rest. (Veritas) pivoting jigs. The locking handles can be pulled & rotated to any detent position. WARNING: DO NOT permanently remove the shrouds that covers the grinding wheel stone. 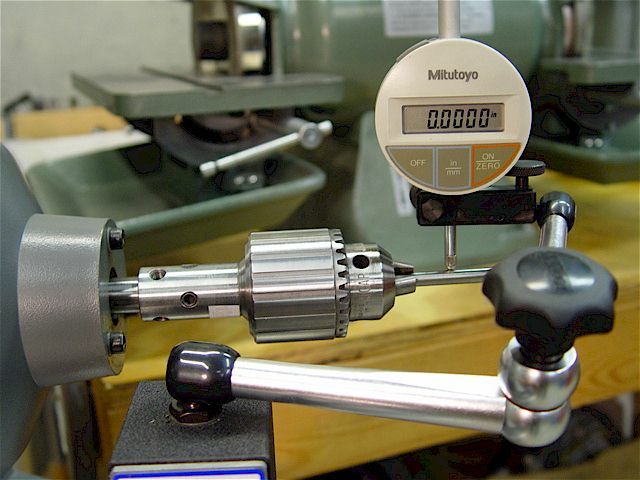 Measuring total indicated runout (TIR) of the chuck using a dowel pin. 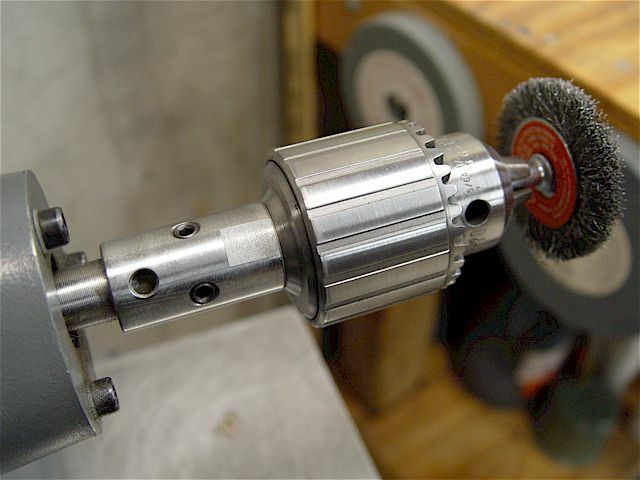 One of my most useful modifications was to mount a drill chuck onto the right side shaft of the grinder. 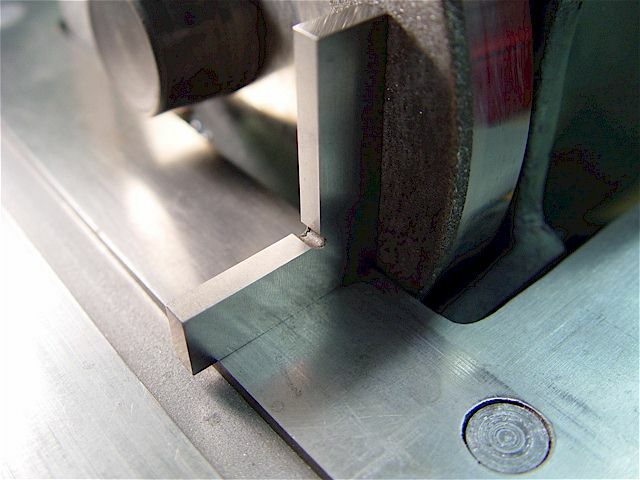 A taper-mounted chuck is not recommended since sideway forces could easily cause it to come loose. from the center of the pre-existing set screw); one every 90 deg. Used hardened USA made set screws. 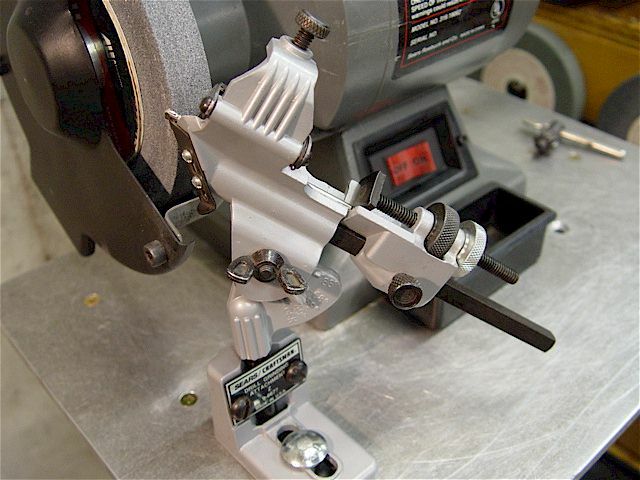 This set screw arrangement allows adjusting the runout in the same manner as a 4-jaw chuck. Any chuck can be used. 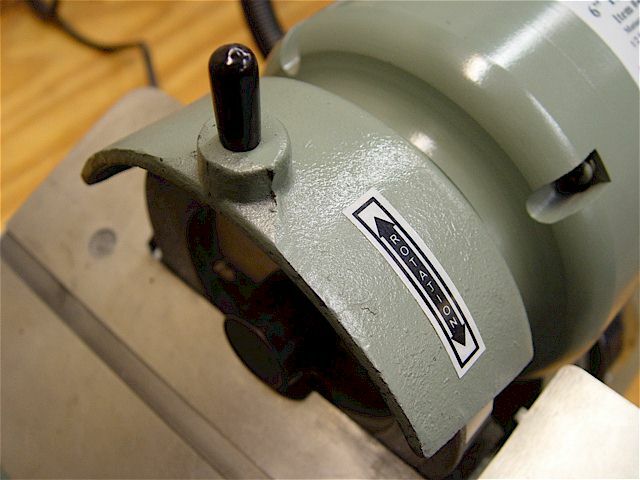 Pictured is a Jacob's medium-duty 5/64" to 1/2" chuck. 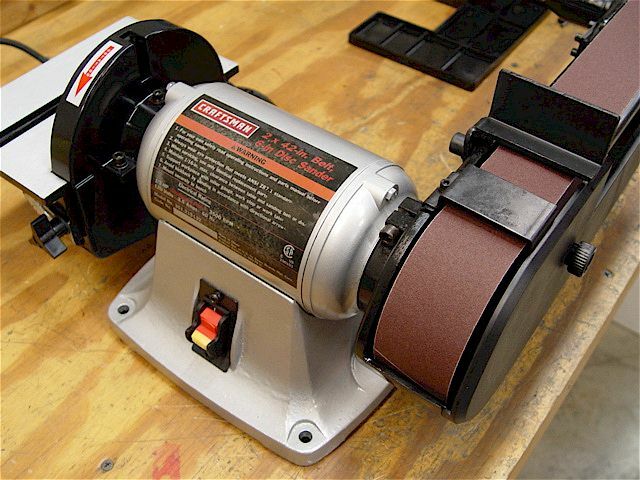 grinder since most accessories (arbors, sanding drums, etc.) are made for that turning direction. Use a full-face visor for eye protection. 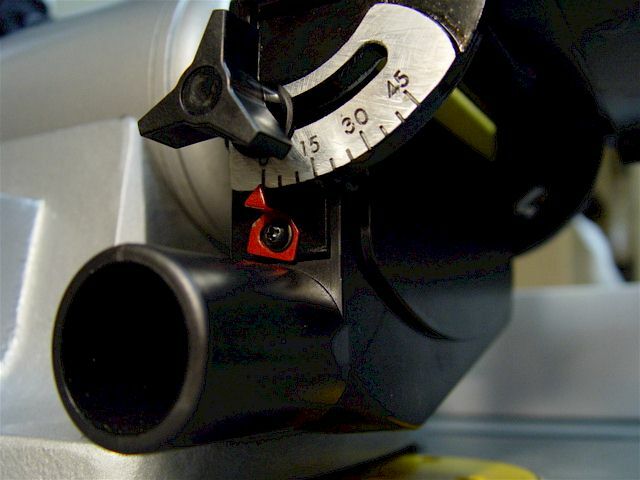 The reflexive tape is for use with a laser tachometer. 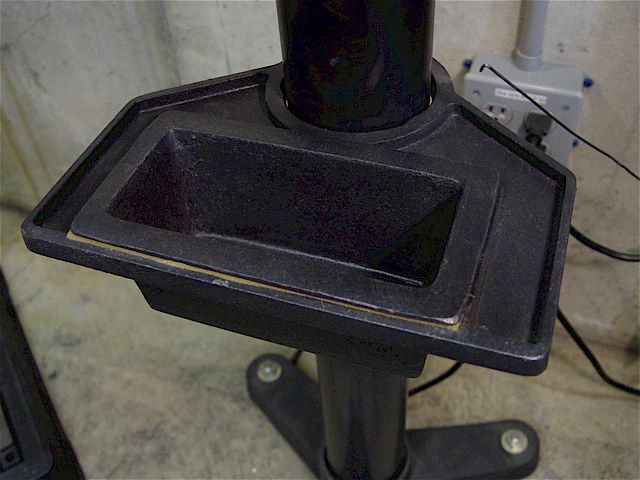 on a free-standing, cast-iron pedestal having rubber feet (manual). 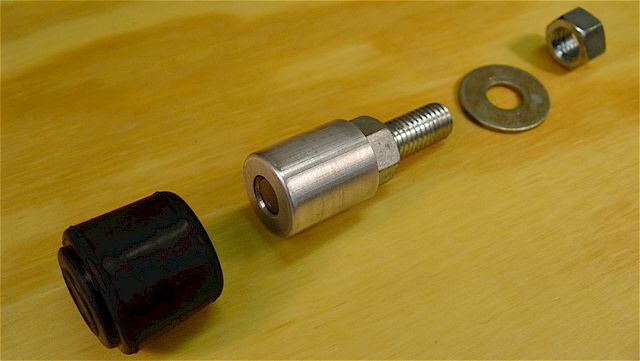 A drill-bit sharpener can also be mounted. 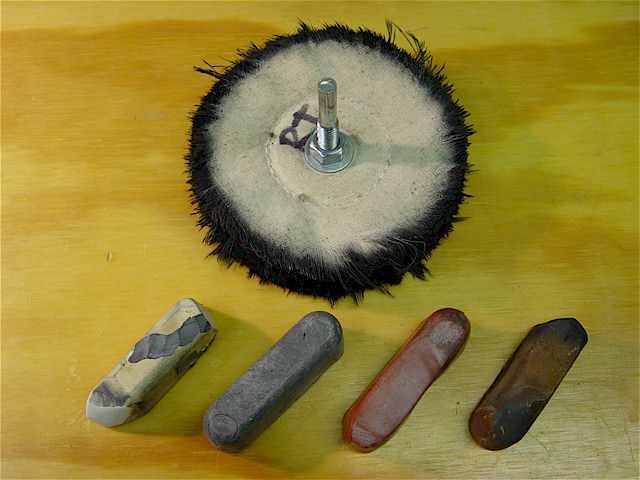 Polishing wheel with different compounds. Each wheel should only have one type of compound on it. 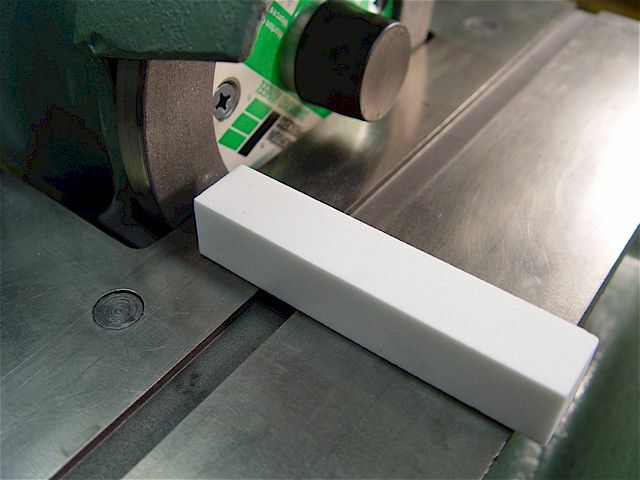 White Rouge (White): gives a bright, shiny luster to stainless steel, aluminum, iron, chrome, & nickel. 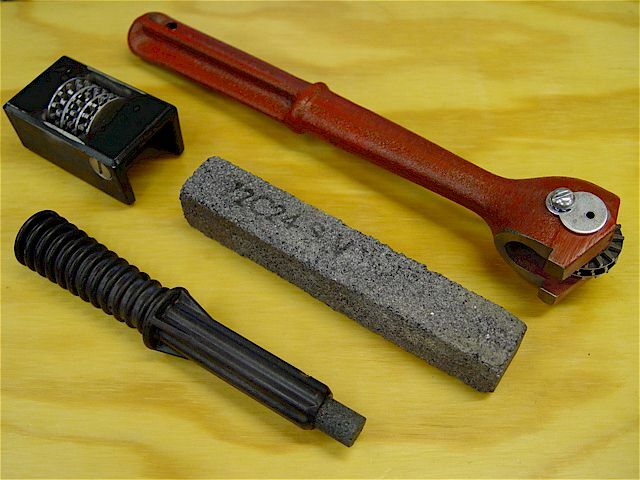 Emery Cake (Black): emery abrasive, gives sharp, fast cutting action to remove scale, rust from iron & steel. Red Rouge (Red): buffing gold, silver, sterling, platinum, etc. Increases luster of already buffed surfaces. 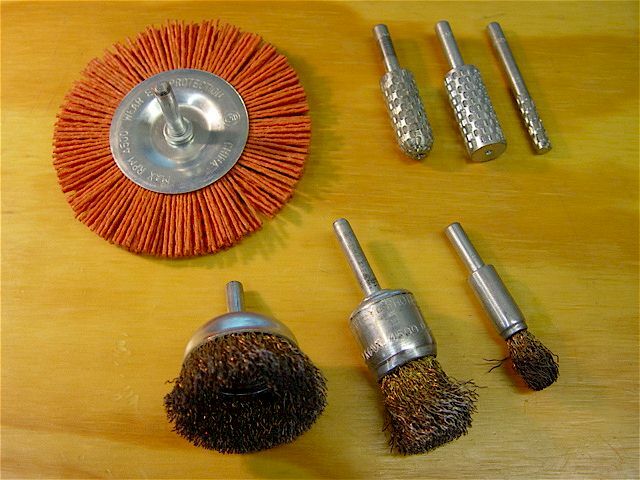 Tripoli (Brown): for buffing aluminum, brass, copper, pewter, bone, plastics, wood, & painted surfaces. 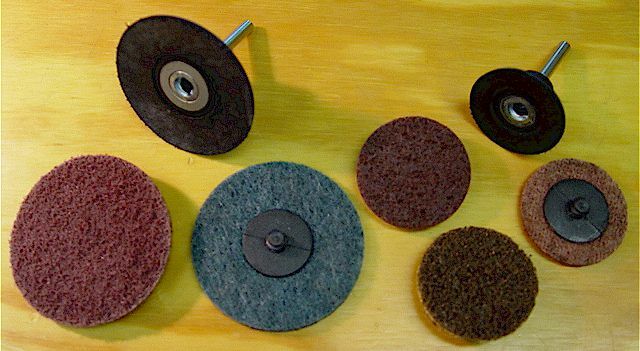 Abrasive disks of varying coarseness that screw onto the rubber-backed arbor. 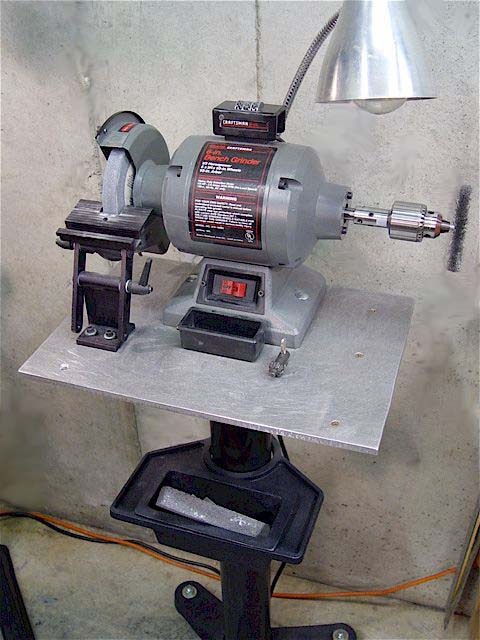 Low-cost, all metal drill bit sharpener that uses a bench grinder. 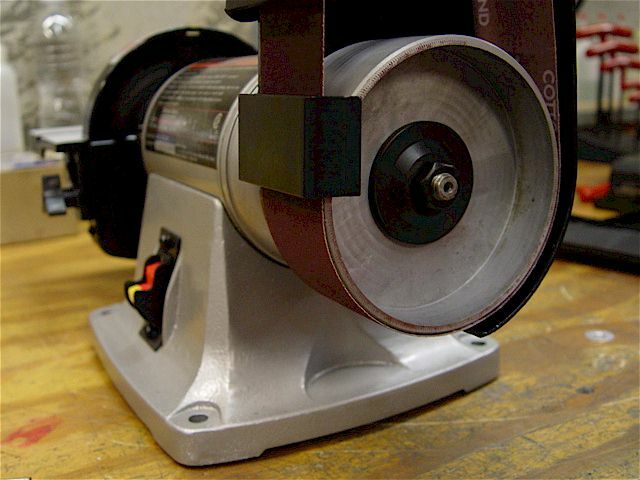 Dress the grinder wheel before use. Grinding attachment manual. 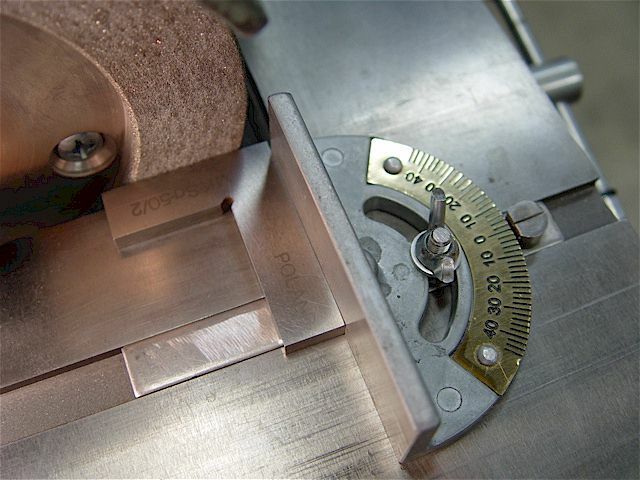 Top & bottom view of a jig used to grind tool bits for threading. 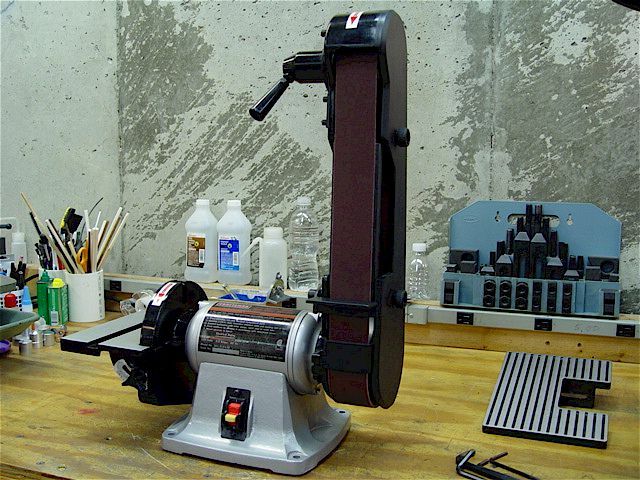 It is rotated 180 deg to grind both angles. 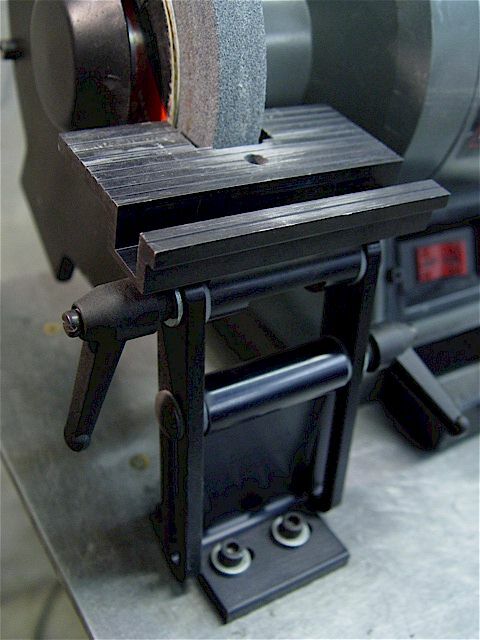 The guide bar is 1/2" x 1/2" x 2". 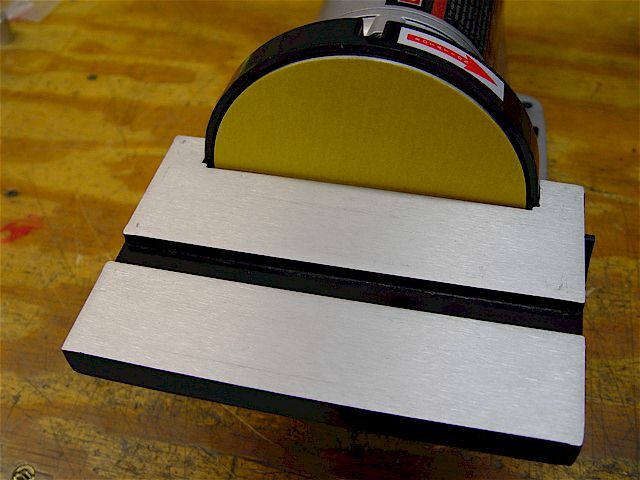 As an alternative, use a lower temperature diamond grinder with its miter. hardened steel. The cup has a valve & allows coolant to be dripped onto the part while grinding. The large, cast-iron pans under each wheel catch the debris/liquid. 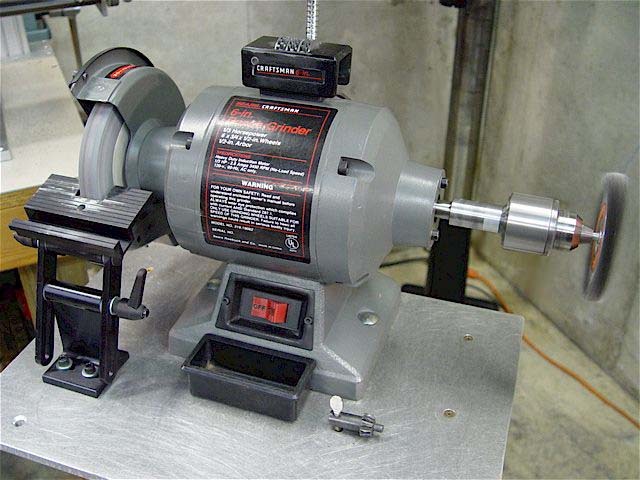 Reference the Six-inch tool grinder manual. 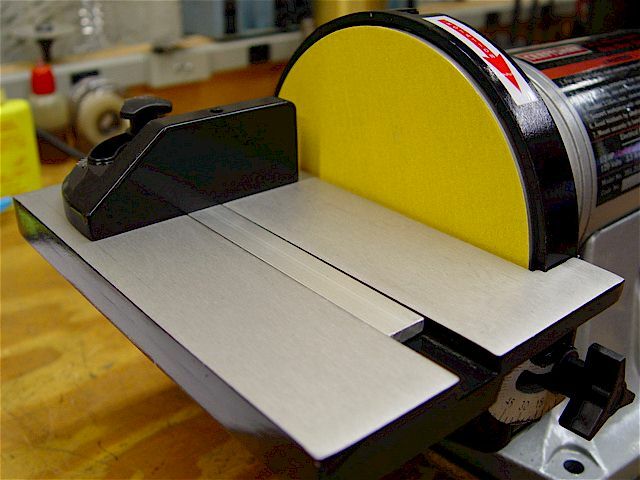 the 220 grit wheel. Diamond wheels do not need (messy) dressing & last a very long time. 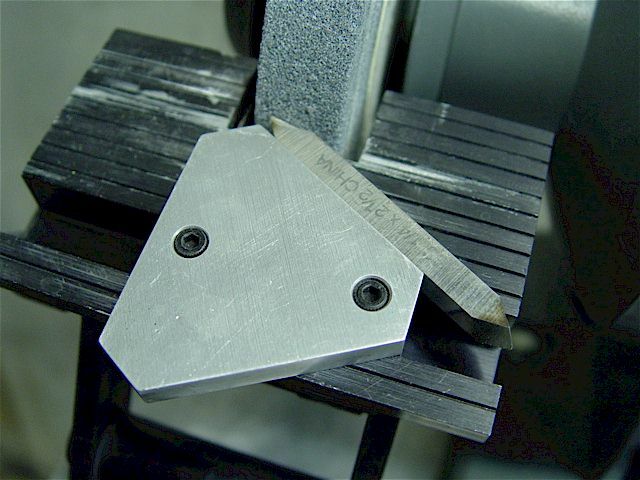 A solid square is used to set the adjustable tilting table to 90 deg. The adjustable miter is being set to 90 deg using a solid square. 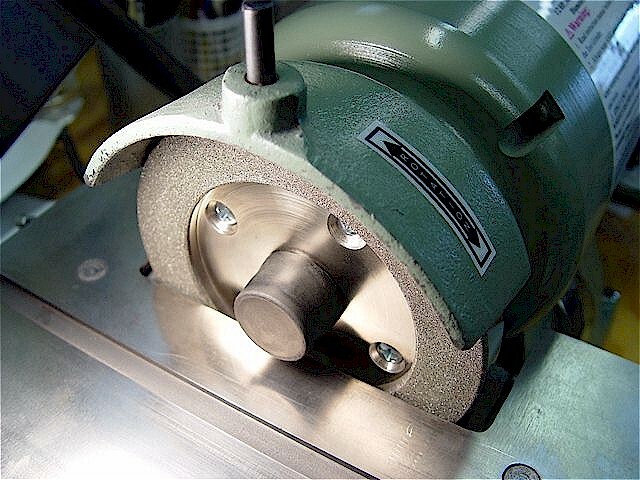 The 5C fixture clamping a bolt for grinding. Holds parts normal (perpendicular); smooth finish. 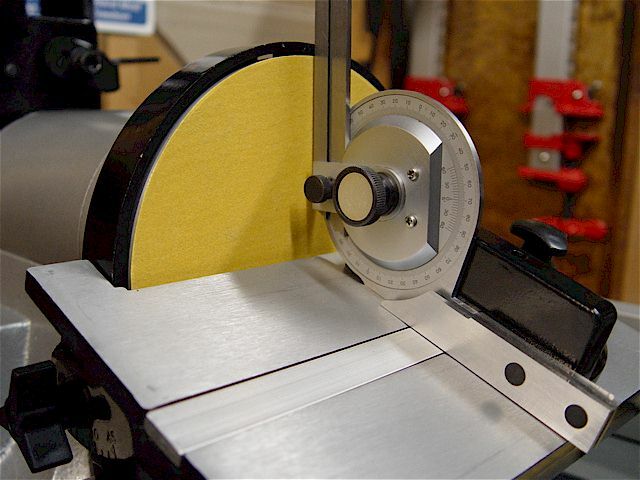 The adjustable miter is being set to 30 deg using a solid angle plate. 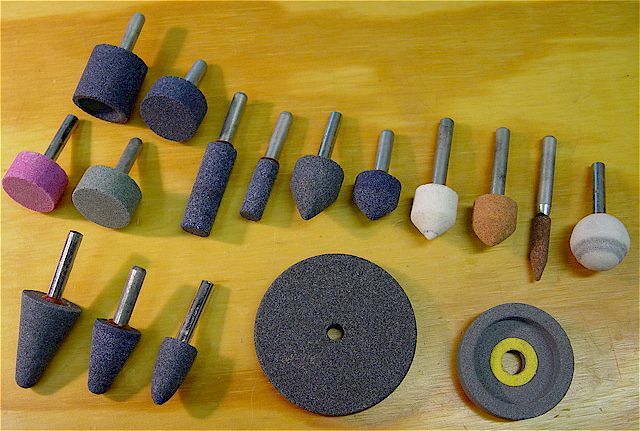 using a regular aluminum oxide wheel then grind only the carbide with the diamond wheel. 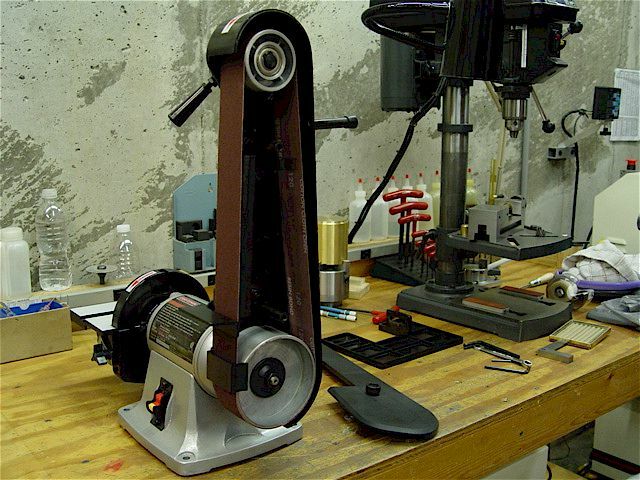 Deburr the screw driver slot & cap the two water cup holder pegs on top the grinder for protection. 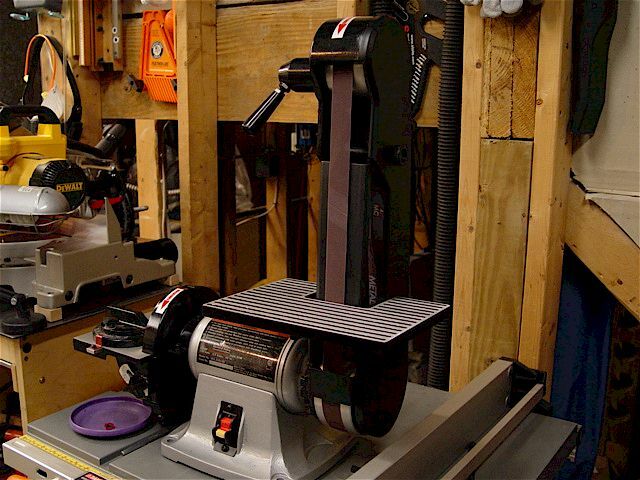 2x42-inch belt, 6-inch disk combo bench sander. Operator's Manual. 6" PSA (Pressure Sensitive Adhesive) disk, weight 32-lbs. 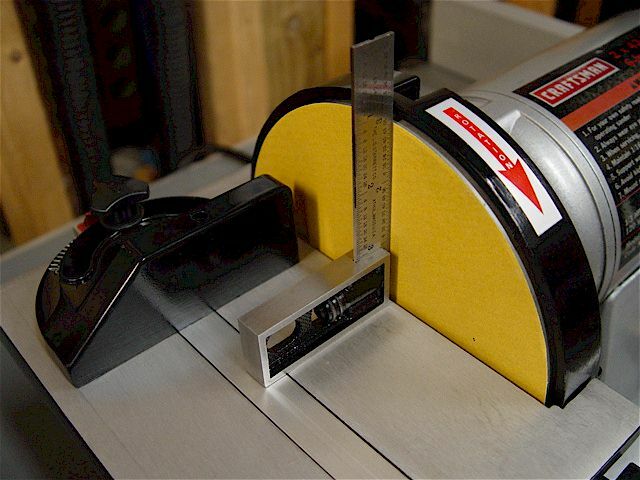 1"x42" belts can also be used. 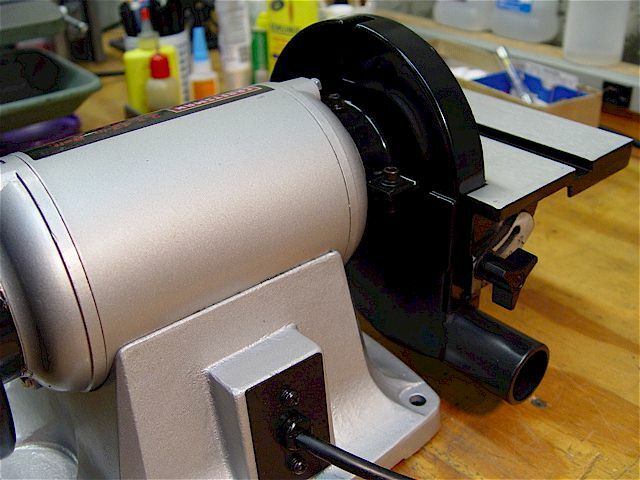 The motor is fully enclosed to keep metallic & wood particles out. Heavy steel base with rubber feet. 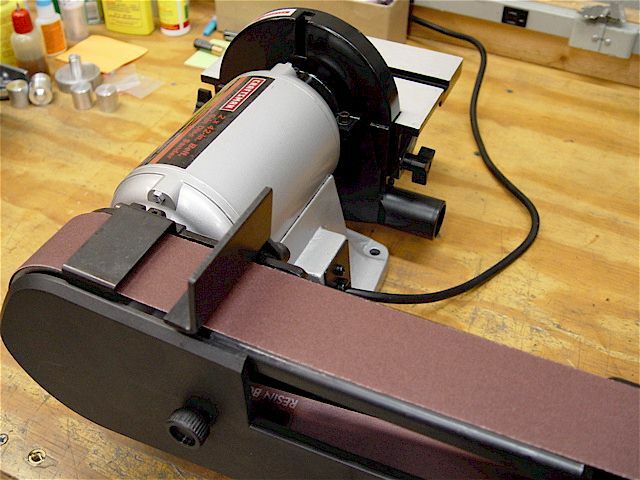 I use this sander to finish metal or wooden surfaces & edges of small parts. The upper disk housing is cast aluminum. The table pivots on two protrusions that slide into L-slots shown here, then the locking knobs are attached. If needed, zero the two red scale pointers after setup with the square. 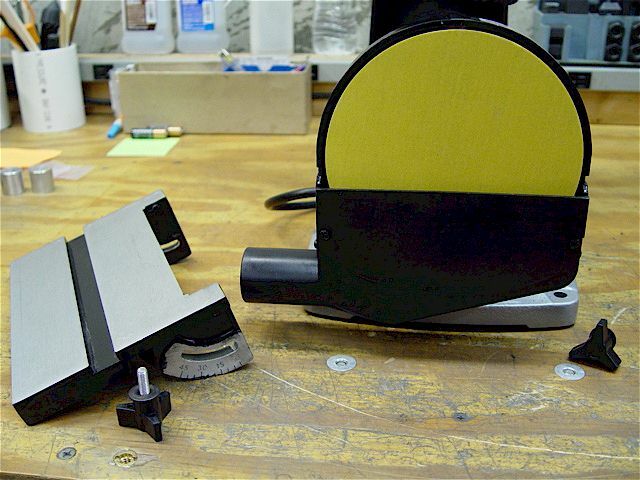 The disk table angle is adjustable 0 to 60 deg (down). 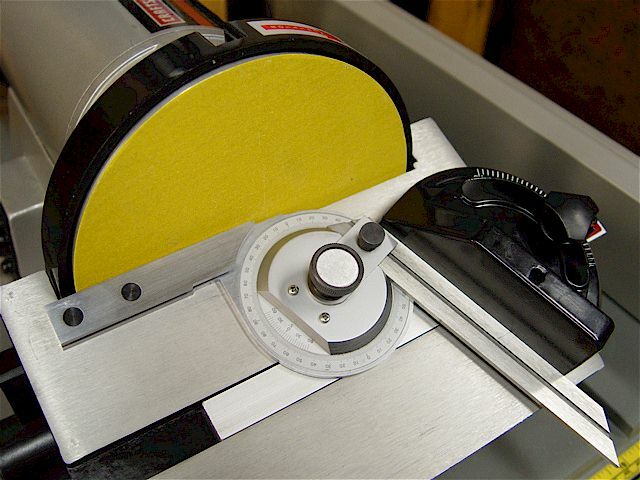 A 220 grit sandpaper disk is attached. 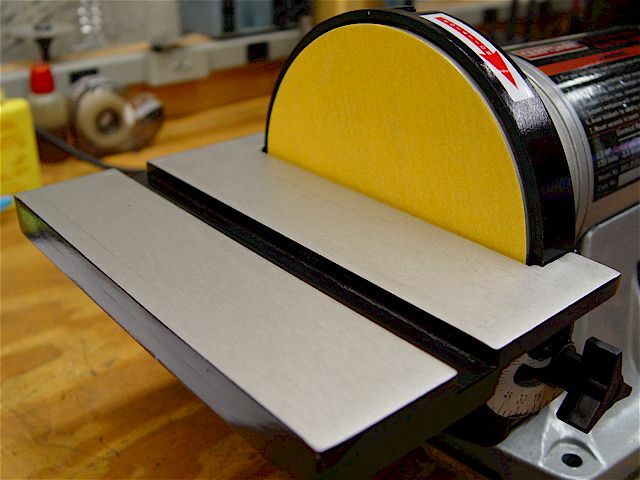 The miter is of all aluminum, albeit thin, construction. 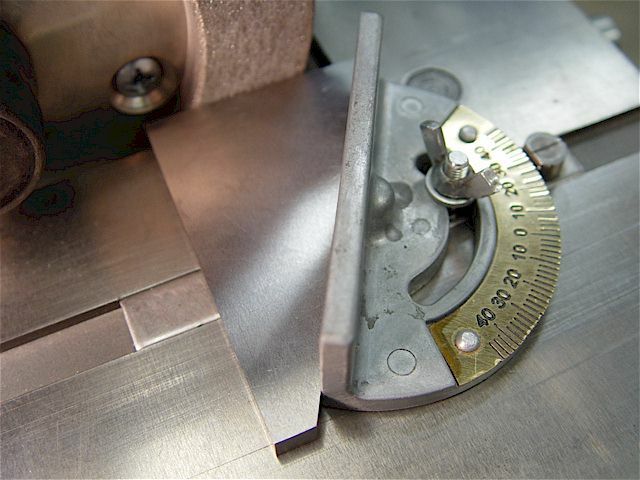 The most accurate way to set the platen & miter is to use a square or other instruments e.g., a protractor. 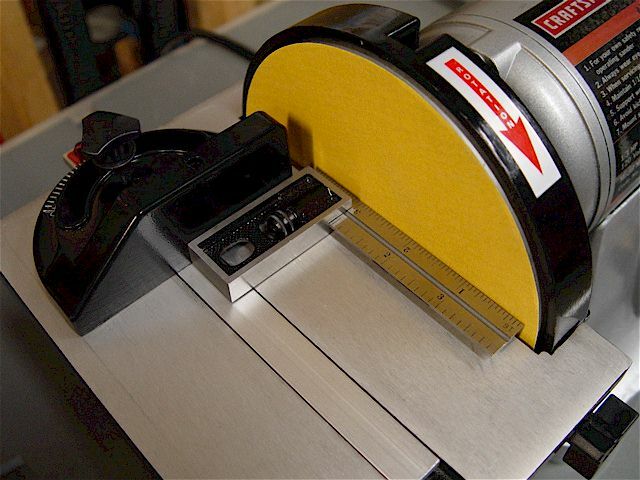 Using a protractor to set a 20 deg table & miter compound angle. Disk table removed to show the dust collection housing. 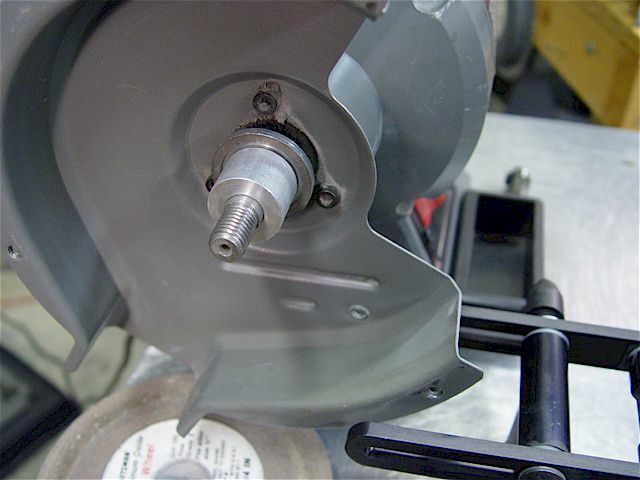 Six screws are removed to replace the sanding disk. Belt table or platen, installed. 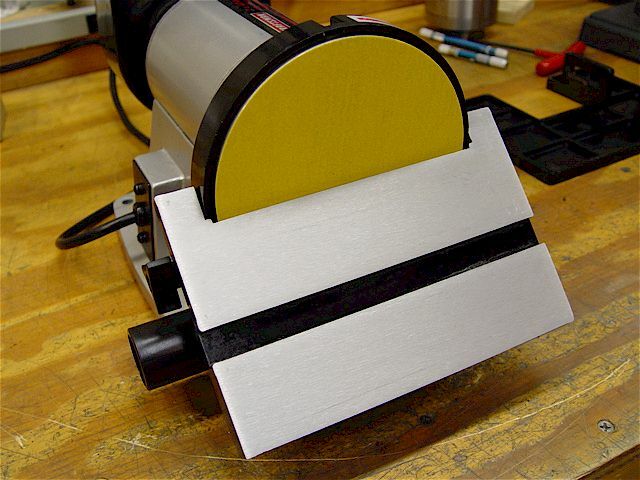 120 grit belt, mounted. 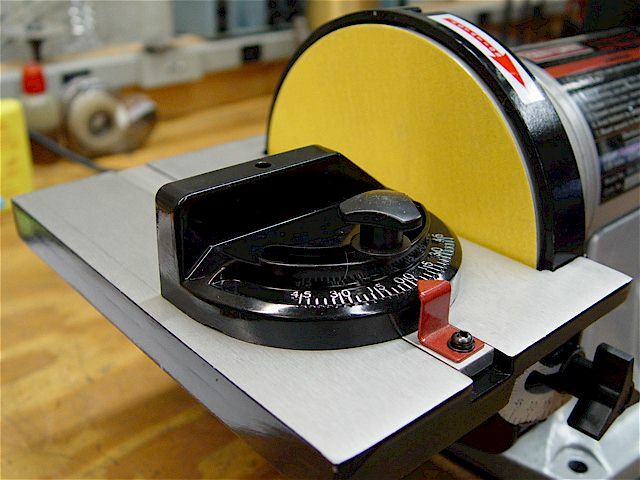 The angle is set in the same manner as the disk platen. 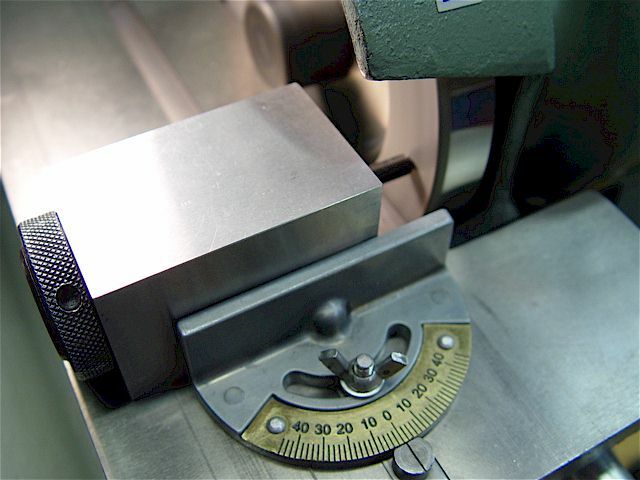 There is not miter & compound angles cannot be set on the belt table. The easy access belt housing locking bolt. 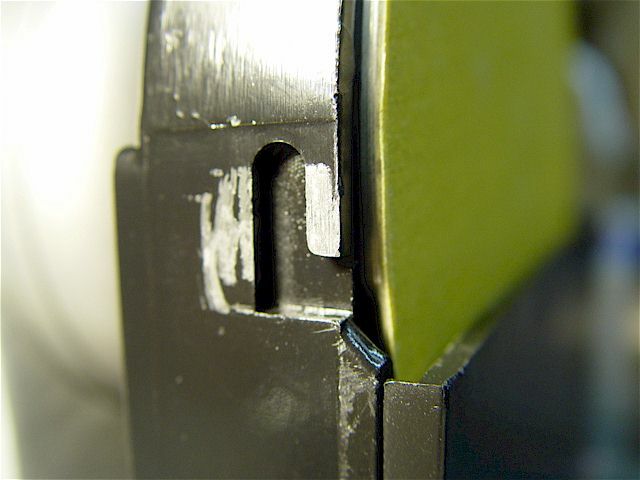 Belt housing moved to & locked in the horizontal position. Housing supported by the horizontal stop (RT). The belt housing is cast aluminum shown with its plastic cover removed. 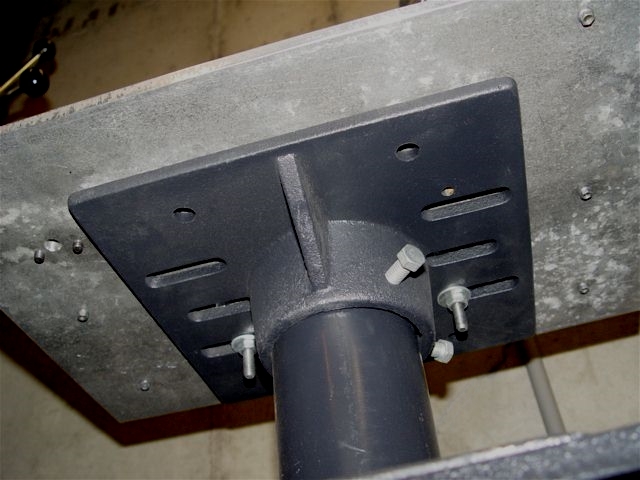 Two captured knobbed bolts hold the cover. 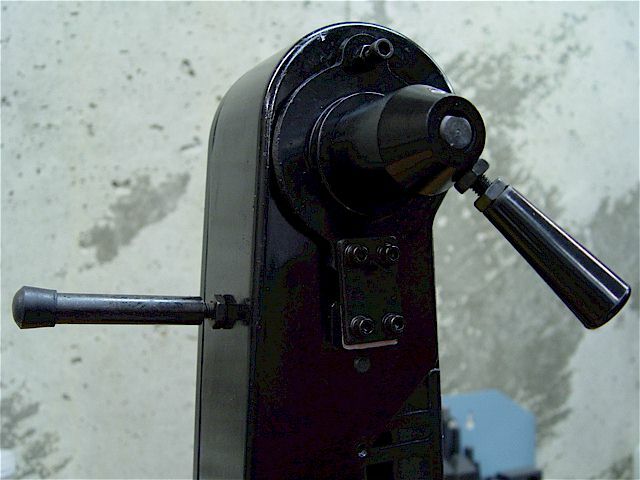 Spring-loaded belt release handle (RT). 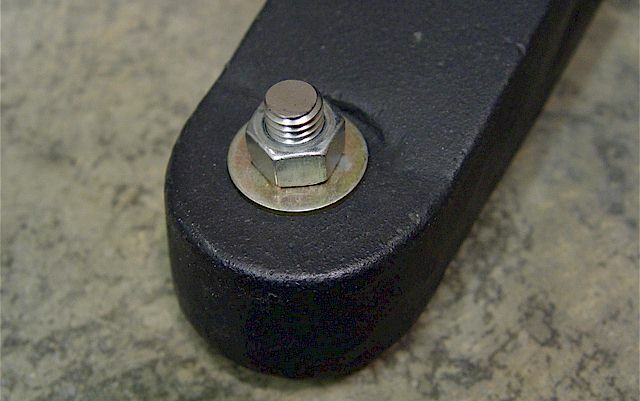 The belt centering adjustment bolt with locking nut is at the top-center. 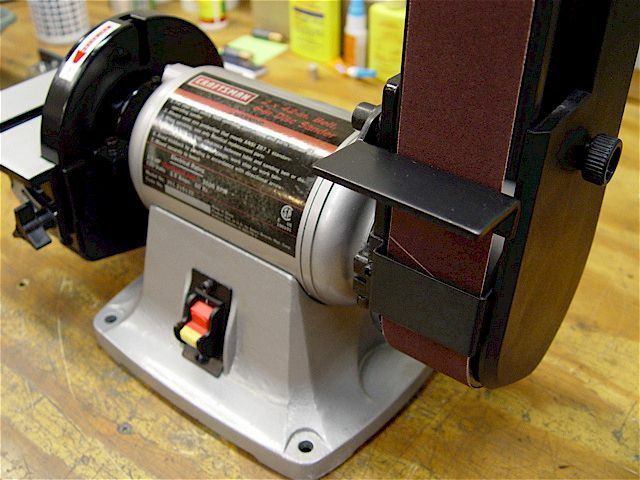 Here a 1" x 42" 220 grit belt is mounted. 1-1/2" rear dust chute for the disk.